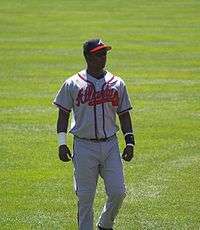 Édgar Enrique Rentería Herazo (Spanish pronunciation: [ˈeðɣar renteˈɾi.a]; born August 7, 1975), nicknamed "The Barranquilla Baby," is a Colombian former professional baseball shortstop. He threw and batted right-handed. He played for the Florida Marlins, the St. Louis Cardinals, the Boston Red Sox, the Atlanta Braves, the Detroit Tigers, San Francisco Giants and Cincinnati Reds. 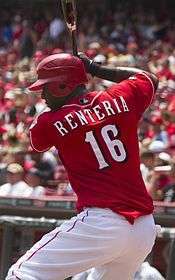 On December 17, the Boston Red Sox signed Rentería to a four-year, forty million dollar contract with an option for 2009 to replace free agent Orlando Cabrera at shortstop. On April 14, he hit his first home run with the Red Sox off Randy Johnson of the Yankees. His double in the eighth inning of that game was the game winner in an 8–5 victory for Boston. From May 26 to 29, he had four straight games with at least three hits, the longest streak since George Brett had six (the record) in 1976. During that stretch, on May 28, he went three for three with a grand slam and five RBI in a 17–1 victory over the Yankees. The next day, he had four hits, including a home run, in a 7–2 victory over New York. For his efforts that week, he won his third career Player of the Week Award. He set a new career high for hits in a month when he had forty hits in August, second in the major leagues. 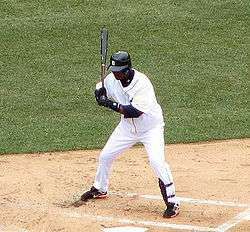 He had a game-winning single on September 24 off B. J. Ryan of the Baltimore Orioles in a 4–3 victory. The win moved the Red Sox into a tie with the Yankees for the AL East lead. He scored one hundred runs in a season for the first time when he scored both runs in a 7–2 loss to Toronto on September 28. He finished the year with a .276 batting average and 172 hits. He struggled defensively, though, as he led the major leagues with a career high 30 errors, and Red Sox fans soon began booing him after he only batted .228 in April. Renteria batted only .231 in the 2005 ALDS as the Red Sox would lose the division series to the Chicago White Sox in just 3 games. The Red Sox were also disappointed with his performance, and on December 8 he was traded to the Atlanta Braves for prospect Andy Marte. In 2012, he received interest and offers from multiple teams, including the Milwaukee Brewers, but teams have been told that he "intends to remain retired." Rentería has two brothers, Edinson and Evert, who played minor league baseball. In 1998, Edgar and his brother Edinson created Team Rentería to help Colombian baseball by giving professional instruction to Colombian professional baseball players and holding youth clinics for amateurs. In 1999, Team Rentería founded the Colombian Professional Baseball League. The league is still in existence today, although the 2010–11 season has been cancelled due to harsh weather. In 1997, Colombian president Ernesto Samper presented Rentería with Colombia's highest honor, the "San Carlos Cross of the Order of the Great Knight." 1 2 Castrovince, Anthony (November 2, 2010). "Edgar Rings-eria! Series MVP is clutch again". MLB.com. Retrieved March 25, 2011. 1 2 3 4 5 6 7 8 9 10 11 12 13 14 15 16 17 18 19 20 21 22 23 24 25 26 27 28 29 30 31 32 33 34 35 36 37 38 39 40 41 42 43 44 "Edgar Renteria". MLB.com. Retrieved January 3, 2011. 1 2 3 4 5 6 "Edgar Renteria Minor League Statistics". Baseball-Reference.com. Retrieved April 1, 2011. ↑ Berardino, Mike (December 23, 2004). "Top Ten Prospects: Florida Marlins". Baseball America. Retrieved April 4, 2011. 1 2 3 4 "The 1996 FLA N Regular Season Batting Log for Edgar Renteria". Retrosheet. Retrieved January 5, 2011. 1 2 3 "The 1996 FLA N Regular Season Batting Log for Kurt Abbott". Retrosheet. Retrieved January 5, 2011. ↑ "Florida Marlins 4, Colorado Rockies 2". Retrosheet. Retrieved January 5, 2011. ↑ "The 1996 FLA N Regular Season Batting Log for Alex Arias". Retrosheet. Retrieved January 5, 2011. ↑ "Florida Marlins 3, Chicago Cubs 2". Retrosheet. Retrieved January 5, 2011. ↑ "Florida Marlins 5, Montreal Expos 2". Retrosheet. Retrieved January 17, 2011. ↑ "Montreal Expos 3, Florida Marlins 2". Retrosheet. Retrieved January 5, 2011. ↑ "Pittsburgh Pirates 5, Florida Marlins 3". Retrosheet. Retrieved April 1, 2011. ↑ Kruth, Cash (July 29, 2010). "Torres delivers in clutch for Giants". MLB.com. Retrieved April 4, 2011. ↑ "1996 NL Rookie of the Year Voting". Baseball-Reference.com. Retrieved January 7, 2011. ↑ "Florida Marlins 4, Cincinnati Reds 3". Retrosheet. Retrieved January 7, 2011. ↑ "Florida Marlins 4, Los Angeles Dodgers 3". Retrosheet. Retrieved February 22, 2011. 1 2 "The 1997 FLA N Regular Season Batting Log for Edgar Renteria". Retrosheet. Retrieved February 23, 2011. ↑ "Florida Marlins 6, Pittsburgh Pirates 5". Retrosheet. Retrieved February 23, 2011. ↑ "1997 National League team statistics and standings". Baseball-Reference.com. Retrieved January 7, 2011. ↑ "Florida Marlins 2, San Francisco Giants 1". Retrosheet. Retrieved January 8, 2011. 1 2 Hill, Thomas (October 27, 1997). "Fish Win on a Grand Scale: Renteria's Single in 11th Sinks Tribe". New York Daily News. Retrieved January 8, 2011. 1 2 3 "The 1998 FLA N Regular Season Batting Log for Edgar Renteria". Retrosheet. Retrieved January 8, 2011. ↑ "Florida Marlins 6, San Diego Padres 5". Retrosheet. Retrieved January 17, 2011. ↑ "Florida Marlins 5, Toronto Blue Jays 4". Retrosheet. Retrieved February 22, 2011. ↑ Nobles, Charlie (June 15, 1998). "BASEBALL; The Bullpen Squanders Nomo's Gem". New York Times. Retrieved January 17, 2011. ↑ "Florida Marlins 8, Montreal Expos 7". Retrosheet. Retrieved January 9, 2011. ↑ "San Francisco Giants 7, Florida Marlins 4". Retrosheet. Retrieved April 1, 2011. ↑ "Edgar Renteria". Baseball-Reference.com. Retrieved January 9, 2011. ↑ "St. Louis Cardinals 5, Los Angeles Dodgers 4". Retrosheet. Retrieved January 11, 2011. ↑ "St. Louis Cardinals 8, Los Angeles Dodgers 3". Retrosheet. Retrieved April 4, 2011. ↑ "St. Louis Cardinals 5, Florida Marlins 2". Retrosheet. Retrieved April 4, 2011. ↑ "St. Louis Cardinals 8, Detroit Tigers 7". Retrosheet. Retrieved February 23, 2011. ↑ "The 1999 STL N Regular Season Batting Log for Edgar Renteria". Retrosheet. Retrieved April 4, 2011. ↑ "San Francisco Giants 5, St. Louis Cardinals 4". Retrosheet. Retrieved February 24, 2011. ↑ "St. Louis Cardinals 8, Florida Marlins 1". Retrosheet. Retrieved February 24, 2011. ↑ "St. Louis Cardinals 13, Milwaukee Brewers 9". Retrosheet. Retrieved January 11, 2011. ↑ "St. Louis Cardinals 11, Pittsburgh Pirates 5". Retrosheet. Retrieved January 11, 2011. 1 2 "The 2000 STL N Regular Season Batting Log for Edgar Renteria". Retrosheet. Retrieved January 11, 2011. ↑ "St. Louis Cardinals 10, Houston Astros 6". Retrosheet. Retrieved February 25, 2011. ↑ "Colorado Rockies 14, St. Louis Cardinals 13 (2)". Retrosheet. Retrieved February 25, 2011. ↑ "Florida Marlins 3, St. Louis Cardinals 1". Retrosheet. Retrieved January 12, 2011. ↑ "St. Louis Cardinals 4, Montreal Expos 2". Retrosheet. Retrieved February 25, 2011. ↑ "Louisville Slugger Silver Slugger Awards". Louisville Slugger. Retrieved January 12, 2011. ↑ "Colorado Rockies 13, St. Louis Cardinals 9". Retrosheet. Retrieved January 14, 2011. ↑ "St. Louis Cardinals 3, Arizona Diamondbacks 1". Retrosheet. Retrieved January 14, 2011. ↑ "St. Louis Cardinals 11, Pittsburgh Pirates 5". Retrosheet. Retrieved January 14, 2011. ↑ "St. Louis Cardinals 4, Cleveland Indians 3". Retrosheet. Retrieved January 14, 2011. ↑ "Arizona Diamondbacks 5, St. Louis Cardinals 3". Retrosheet. Retrieved January 15, 2011. ↑ "St. Louis Cardinals 6, Milwaukee Brewers 5". Retrosheet. Retrieved January 15, 2011. ↑ "Chicago Cubs 6, St. Louis Cardinals 5". Retrosheet. Retrieved January 12, 2011. ↑ Schmetzer, Mark (May 10, 2002). "Renteria gives Cards a lift". MLB.com. Retrieved January 16, 2011. ↑ "Milwaukee Brewers 7, St. Louis Cardinals 2". Retrosheet. Retrieved January 16, 2011. ↑ Hoffman, Jared (July 26, 2002). "Finley wins with Cards over Cubs". MLB.com. Retrieved January 16, 2011. ↑ Hoffman, Jared (July 28, 2002). "Cardinals stun Cubs in ninth". MLB.com. Retrieved January 17, 2011. ↑ Frisaro, Joe (July 30, 2002). "Cards use homers to beat Marlins". MLB.com. Retrieved February 21, 2011. ↑ Mandel, Ken (August 18, 2002). "Renteria's slam decks Phillies". MLB.com. Retrieved February 21, 2011. ↑ Leach, Matthew (September 4, 2002). "Down 5–0, Cards defeat Reds". MLB.com. Retrieved February 25, 2011. ↑ Leach, Matthew (November 5, 2002). "Renteria, Rolen win Sliver Sluggers". MLB.com. Retrieved February 26, 2011. ↑ Leach, Matthew and Jared Hoffman (November 13, 2003). "Four Cardinals win Gold Gloves". MLB.com. Retrieved February 27, 2011. ↑ "St. Louis Cardinals 11, Houston Astros 8". Retrosheet. Retrieved February 26, 2011. ↑ "St. Louis Cardinals 13, New York Mets 3". Retrosheet. Retrieved February 26, 2011. ↑ "St. Louis Cardinals 8, Boston Red Sox 7". Retrosheet. Retrieved February 26, 2011. ↑ Leach, Matthew (June 13, 2003). "Clemens hits milestones vs. Cards". MLB.com. Retrieved February 26, 2011. 1 2 "The 2003 STL N Regular Season Batting Log for Edgar Renteria". Retrosheet. Retrieved February 27, 2011. ↑ Leach, Matthew (September 18, 2003). "Woody and Cards blank Brewers". MLB.com. Retrieved February 27, 2011. ↑ Leach, Matthew (September 27, 2003). "Renteria reaches milestone in win". MLB.com. Retrieved February 28, 2011. ↑ Leach, Matthew (October 29, 2003). "Pujols, Renteria win Silver Sluggers". MLB.com. Retrieved March 1, 2011. ↑ Leach, Matthew (November 5, 2003). "Four Cards take Gold on defense". MLB.com. Retrieved March 1, 2011. ↑ "St. Louis Cardinals 10, Arizona Diamondbacks 2". Retrosheet. Retrieved March 2, 2011. ↑ Leach, Matthew (June 9, 2004). "Renteria's slam powers Cardinals". MLB.com. Retrieved March 1, 2011. ↑ Falkoff, Robert (June 26, 2004). "Cards use brains to beat Royals". MLB.com. Retrieved March 1, 2011. ↑ "St. Louis Cardinals 11, Seattle Mariners 2". Retrosheet. Retrieved March 6, 2011. ↑ Leach, Matthew (July 4, 2004). "Renteria gives Cards three of a kind". MLB.com. Retrieved March 1, 2011. ↑ Wallner, Jeff (July 15, 2004). "Pujols powers Cards past Reds". MLB.com. Retrieved March 2, 2011. ↑ Leach, Matthew (August 8, 2004). "Renteria helps Cards finish sweep". MLB.com. Retrieved March 1, 2011. ↑ Leach, Matthew (August 22, 2004). "Edgar powers streak to four". MLB.com. Retrieved March 6, 2011. ↑ "Renteria agrees to four-year deal with champs". ESPN.com. Associated Press. December 16, 2004. Retrieved December 6, 2008. ↑ Browne, Ian (December 17, 2004). "Sox, Renteria make deal official". MLB.com. Retrieved March 6, 2011. ↑ Browne, Ian (April 15, 2005). "Renteria has his breakout with Red Sox". MLB.com. Retrieved March 7, 2011. ↑ Browne, Ian (May 28, 2005). "Record rout gets Sox off Matt". MLB.com. Retrieved March 7, 2011. ↑ Browne, Ian (May 30, 2005). "Boomtown revival in New York". MLB.com. Retrieved March 7, 2011. ↑ Browne, Ian (September 24, 2005). "Renteria lifts Sox into AL East tie". MLB.com. Retrieved March 7, 2011. ↑ "The 2005 BOS A Regular Season Batting Log for Edgar Renteria". Retrosheet. Retrieved March 7, 2011. 1 2 Bowman, Mark (December 12, 2005). "Renteria takes over at shortstop". MLB.com. Retrieved March 31, 2011. ↑ Bowman, Mark (December 8, 2005). "Braves make splash in Dallas". MLB.com. Retrieved March 7, 2011. ↑ Bowman, Mark (April 28, 2006). "Notes: Renteria back in lineup". MLB.com. Retrieved March 8, 2011. ↑ Bowman, Mark (May 28, 2006). "Record day for Braves in sweep of Cubs". MLB.com. Retrieved March 8, 2011. ↑ Bowman, Mark (July 4, 2006). "Braves sensing momentum shift". MLB.com. Retrieved March 8, 2011. ↑ Bowman, Mark (July 10, 2006). "Renteria returns to All-Star form". MLB.com. Retrieved March 8, 2011. ↑ Walsh, Michael (August 17, 2006). "Braves blank Nats in finale". MLB.com. Retrieved March 8, 2011. ↑ Bowman, Mark (April 2, 2007). "Renteria the hero for Braves in opener". MLB.com. Retrieved March 8, 2011. ↑ "Braves 9, Rockies 7". MLB.com. April 27, 2007. Retrieved March 9, 2011. ↑ Bowman, Mark (May 15, 2007). "Hudson tosses another gem, beats Nats". MLB.com. Retrieved March 9, 2011. ↑ Radcliffe, J. R. (May 30, 2007). "Big rally helps Braves back Hudson". MLB.com. Retrieved March 9, 2011. ↑ "Braves 6, Indians 2". MLB.com. June 16, 2007. Retrieved March 9, 2011. ↑ Bowman, Mark (August 3, 2007). "Braves place Renteria on DL". MLB.com. Retrieved 2011-03-10. ↑ Bowman, Mark (August 22, 2007). "Renteria re-injures ankle in first at-bat". MLB.com. Retrieved March 11, 2011. ↑ Bowman, Mark (August 23, 2007). "Notes: Renteria returns to 15-day DL". MLB.com. Retrieved March 11, 2011. ↑ Lutz, Jeff (September 9, 2007). "Notes: Renteria's wheel of steel". MLB.com. Retrieved March 11, 2011. ↑ Bowman, Mark (October 29, 2007). "Braves get two prospects for Renteria". MLB.com. Retrieved March 11, 2011. ↑ Beck, Jason (April 17, 2008). "Tigers show their stripes in Cleveland". MLB.com. Retrieved March 11, 2011. ↑ Beck, Jason (April 23, 2008). "Homer-happy Tigers cruise to win". MLB.com. Retrieved March 11, 2011. ↑ Beck, Jason (May 21, 2008). "Tigers' bats awaken, maul Mariners". MLB.com. Retrieved March 11, 2011. ↑ McNeish, Scott (June 7, 2008). "Thames, Renteria homer in big eighth". MLB.com. Retrieved March 12, 2011. 1 2 Beck, Jason (June 18, 2008). "Raburn, Thames notch big homers". MLB.com. Retrieved March 12, 2011. ↑ Beck, Jason (October 30, 2008). "Tigers buy out Renteria's option". MLB.com. Retrieved October 30, 2008. ↑ Castrovince, Anthony (December 1, 2008). "Tigers won't take risk with Renteria". MLB.com. Retrieved March 12, 2011. ↑ Haft, Chris (December 4, 2008). "Giants sign Renteria to two-year deal". MLB.com. Retrieved February 22, 2011. ↑ Haft, Chris (April 22, 2009). "Giants win behind Renteria's outburst". MLB.com. Retrieved March 13, 2011. ↑ Haft, Chris (April 30, 2009). "Giants coast behind Lincecum". MLB.com. Retrieved March 14, 2011. ↑ Haft, Chris (May 15, 2009). "Ninth-inning runs burn Wilson, Giants". MLB.com. Retrieved March 14, 2011. ↑ Haft, Chris (August 30, 2009). "Giants slam their way to Wild Card tie". MLB.com. Retrieved March 15, 2011. ↑ Haft, Chris (September 27, 2009). "Surgery shows Renteria's fortitude". MLB.com. Retrieved March 16, 2011. ↑ Haft, Chris (April 7, 2010). "Giants complete sweep of Astros". MLB.com. Retrieved March 16, 2011. ↑ "The 2010 SF N Regular Season Batting Log for Edgar Renteria". Retrosheet. Retrieved March 17, 2011. ↑ Haft, Chris (April 30, 2010). "Renteria leaves with tightness in groin". MLB.com. Retrieved March 17, 2011. ↑ Haft, Chris (May 7, 2010). "Giants put Renteria on DL, demote Velez". MLB.com. Retrieved March 20, 2011. ↑ Haft, Chris (May 22, 2010). "Renteria's return makes infield crowded". MLB.com. Retrieved March 20, 2011. ↑ Eymer, Rick and Cash Kruth (May 27, 2010). "Renteria goes on DL with hamstring issue". MLB.com. Retrieved March 20, 2011. ↑ Hall, James (June 29, 2010). "Renteria returns to Giants' lineup". MLB.com. Retrieved March 20, 2011. ↑ Haft, Chris (August 11, 2010). "Renteria goes on DL with biceps strain". MLB.com. Retrieved March 20, 2011. ↑ Kruth, Cash (September 1, 2010). "Renteria returns, but Uribe to remain at short". MLB.com. Retrieved March 20, 2011. ↑ Haft, Chris (September 16, 2010). "Overpowering Giants claim first place in West". MLB.com. Retrieved March 20, 2011. 1 2 3 Nelson, Amy K. (November 1, 2010). "How very sweet it is for Edgar Renteria". ESPN. Retrieved November 4, 2010. 1 2 Kruth, Cash (October 19, 2010). 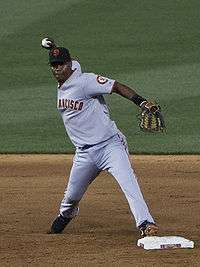 "Veteran Renteria produces spark for Giants". MLB.com. Retrieved March 21, 2011. 1 2 "The 2010 SF N League Championship Series Batting Log for Edgar Renteria". Retrosheet. Retrieved March 21, 2011. ↑ "The 2010 SF N World Series Batting Log for Edgar Renteria". Retrosheet. Retrieved March 21, 2011. ↑ Gonzalez, Alden (October 29, 2010). "Renteria rediscovers World Series magic". MLB.com. Retrieved March 22, 2011. 1 2 Haft, Chris (November 2, 2010). "Giants win the Series! Giants win the Series!". MLB.com. Retrieved March 25, 2011. ↑ Rojas, Enrique (November 7, 2010). "Edgar Renteria not retiring this year". ESPN. Retrieved November 17, 2010. ↑ Haft, Chris (January 7, 2011). "Renteria on verge of leaving Giants for Reds". MLB.com. Retrieved March 25, 2011. ↑ Rojas, Enrique (January 7, 2011). "Edgar Renteria signs with Reds". ESPN. Retrieved March 26, 2011. ↑ Schlegel, John (March 13, 2011). "Janish prepared to step into a starting role". MLB.com. Retrieved April 1, 2011. ↑ Simon, Andrew (March 21, 2013). "Former World Series MVP Renteria retires". MLB.com. Retrieved October 12, 2014. 1 2 "History and Background". Team Renteria. Retrieved March 27, 2011. ↑ Villalobos, José David (December 8, 2010). "Colombian Professional Baseball League 2010–2011 cancelled". Team Renteria. Retrieved March 27, 2011. ↑ "Edgar Renteria: Postseason Players". MLB.com. Retrieved April 4, 2011.